But if there’s one thing Bevel Dom isn’t afraid to do, it’s fighting for the man he loves. 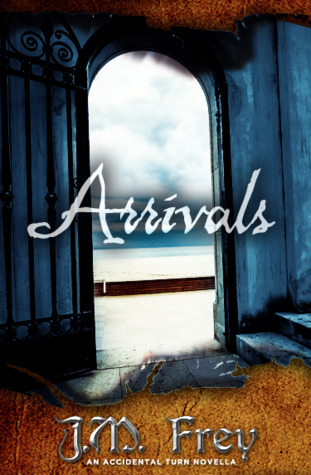 Arrivals is a short story that takes place between The Forgotten Tale and The Silenced Tale. I was excited when I read the blurb and found out that it was about Bevel and Kintyre. They have to be one of my favorite fictional couples. I couldn’t wait to see where this short story would take their relationship. I was not let down. I liked Arrivals plotline. Bevel and Kintyre have taken over living in Turn Hall. Kintyre is learning that running Turn Hall is a lot more work than Forsyth led on. Bevel is lost. He feels out-of-place at Turn Hall. He is used to being Kintyre’s right-hand man. But the new Lord doesn’t need a right-hand man. Bevel soon has more to worry about than where he falls in Kintyre’s life. When word gets out that Kintyre has returned, women descend on Turn Hall. Women who were determined to marry Kintyre. But there are other developments. Developments that Bevel didn’t see coming. Developments that could change his relationship with Kintyre. Can Bevel deal with the unmarried women and the development? Will he fight for Kintyre’s affection? Or will he let doubt and fear destroy the happiness that he has finally found? I felt bad for Bevel during the book. He was so insecure about Kintyre’s love. It made me sad to see him that way. It also made me sad that he seemed to float around Turn Hall, not sure what his role was. He did have an opportunity to take over Forsyth’s job as spymaster. He couldn’t bring himself to put on the Shadow Mask. After what he saw in The Forgotten Tale, I don’t blame him. The whole baby fever angle did make me laugh a bit. I loved how Kintyre’s character matured. He went from being on the road with no care in the world to a Lord with many responsibilities. He also had to soothe Bevel almost continuously. It would have driven me nuts to have such an insecure partner. I felt he dealt that Bevel very graciously. He did surprise me a couple of times in the book with what he did for Bevel to ease his insecurities. The huge surprise that happened at the end of the book was surprising. I wasn’t expecting that person to show up. I thought that Kintyre did deal with it very well. I loved the end of Arrivals. It was what I expected and that made me happy. I would rate Arrivals for Older Teens. There are some mild violence and mild sexual situations. Nothing is described in great detail but it is there. I would recommend that anyone over the age of 16 read this book. There is also no triggers. I would like to thank L.M. Frey for allowing me to read and review Arrivals. All opinions stated in this review of Arrivals are mine.